There were various possible approaches to build this list, and in the end I resolved to not use data from competitive games. The pick and win rate statistics presented are extrapolated from very high level pubs, from 5k+ rank upward. Only the past 30 days are examined to skip the period pre-hot fixes. In the table, the heroes are arranged by win rate, but the pick rate is likewise an essential factor when making your choice. Those played the most can adapt to more matchups, while the others usually require to face a specific team to do their job. I talked about Huskar in a previous article describing his shortcomings and best teammates. Take a look for more information. He is one of the top hero killers of the patch and a dominant presence in the early game. When matched against the right team he can be a big nuisance, but at the same time a vast number of heroes can crush his gameplay. High ranked players usually know when it is preferable picking a certain hero, and this justifies the low 4.3% pick rate. Instead, if we consider all ranks, Huskar’s win rate drops down to 48.3%. The former will counter your gameplay from the early game, preventing kills and limiting your chances to snowball; the latter are better carries once they are online and can melt you. Huskar is also weak against illusions based heroes such as Phantom Lancer and Chaos Knight as he is purely a single target dps. Omniknight is also one of the most drafted heroes in a competitive games with a win rate above 60%. In 7.07d, IceFrog reduced the cast range of Purification from 575 to 450, and rescaled Guardian Angel cooldown from 160 to 180/170/160. These adjustments have not harmed his laning phase a lot, but he has been severely nerfed in teamfight because he needs to be closer to the battle to do his job. Still, in my judgment it isn't enough to stop him and he will continue having an excellent win rate. 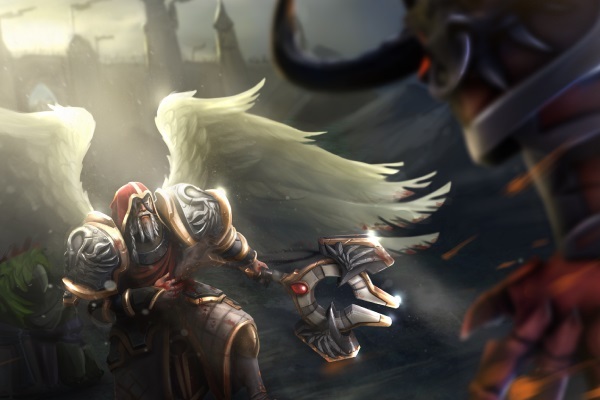 The solo offlane Omniknight is a thing in 7.07 pubs, so you should know how to counter him. He is very hard to zone out because starts with 5.5 armor at level 1, 18 damage block via the Stout Shield, a heal, and a strong aura. Stack and pull the camps as much as possible because you want to limit his experience growth. Omniknight reaches a power peak in the lane at level 5 with three levels of Purification and the 18% attack/movement speed slow from Degen Aura. Degen Aura is a big threat, but against heavy harassing he will be forced to skill Repel, lowering his efficiency in the lane. Get ranged heroes able to spam spells, and buy multiple clarities. Start with 2-3 mana potions, but purchase more during the lane phase. Many players commit a colossal mistake not acquiring more just to save money - you can't do your job without mana! Lich's Frost Blast is a spammable nuke that damages and slows the target. Sacrifice is a steady source of mana, helps to manage the lane, and reduces the experience gain of the enemy players. Venomancer is another perfect choice because he can keep Omniknight slowed down with Poison Sting and Venomous Gale, forcing him to get a level into Repel to survive. Never pick melee supports as they can’t even harass against the slow of Degen Aura and the heal/nuke of Purification. Brewmaster brings a bunch of utility to the team via his spirits’ abilities and a versatile item build. During the lane phase - mid or offlane - he can win against most melee heroes, and requires just a pair of Arcane Boots and a Blink Dagger to do his work. In lane, he can easily harass the opponent and prevent his last hits with Drunken Haze. For only 25 mana Brewmaster can apply a slow and a 70% attack miss chance. This debuff also makes him a powerful anti-right click carry in the late game. He is a tough hero thanks to his abilities and 660 health points at level one so he isn’t an easy victim for ganks. A grandmaster during teamfights if in the right hands. Your three spirits can alter the fate of all battles in the mid-game and are a great source of disables. With a proper micromanagement he can keep two heroes disabled, dispel the enemy team, and torment the supports with the Fire Panda’s Permanent Immolation. Versatile item build and scales well with aura items as they work on pandas, which makes him a great addition in many teams. Very difficult to counter, and rarely a team will build a draft against him. Beware of the skill required for micromanaging his spirits. All players can handle the skills of the hero, but only a few can master Primal Split. Most Brewmasters just use Hurl Boulder, Cyclone, and then chase a hero with the three pandas, neglecting the remaining abilities and their cooldown. Night Stalker has been a leading competitive pick for multiple months in a row, and of course is a dangerous hero also in pubs. He possesses an amazing roaming and ganking power at all stages of the game and is powerful since the first night. But, what makes him so popular is his ability to manipulate the map vision of the teams. Thanks to Darkness, Night Stalker has an advantage when fighting at night. He doesn’t just empower the night vision for his own team, but also limits the max vision range of the enemies, including their wards. IceFrog nerfed his vision multiple times, but Night Stalker is still a top 5 drafted hero in pro games. 7.07 reduced his daytime vision from 1200 to 800, but this nerf barely affected him as he mostly hunts at night, and he can rely on the team vision during the day. 7.07c decreased Hunter in the Night flying vision from 1200 to 1000, and changed Darkness vision limit against buildings and wards from 675 to 800. The latter is the real big deal. When Darkness is active, you need perfectly placed wards to cover all the critical spots on the map as they must be directly on the path. Observer wards have a standard vision radius of 1600. Moving from 650 to 800 at night isn’t a massive boost, but can still help and save the team in different occasions. Finally, do not forget that these modifications are intended for competitive games - honestly, I don’t think many people in pubs even know how to act against a Night Stalker. I highly suggest Dragon Knight to new players because is a resilient hero able to survive and inflict damage even after a bad laning phase. He doesn’t require much practice to impact the game, and as a plus is also a good pusher when in Dragon Form. You can build him in various ways according to the team needing and your gameplay. Let’s have a quick look at the item build. Stout Shield, Soul Ring/Bottle, Magic Wand, Power Treads, and Armlet of Mordiggian are the ideal core items. In an early game pushing lineup you can replace the Armlet with the Drum of Endurance. Some players prefer the Phase Boots for the extra movement speed, but that’s a flawed option. The stats and attack speed of the Power Treads are more valuable on this hero. Blink Dagger or Shadow Blade are both optimal items. 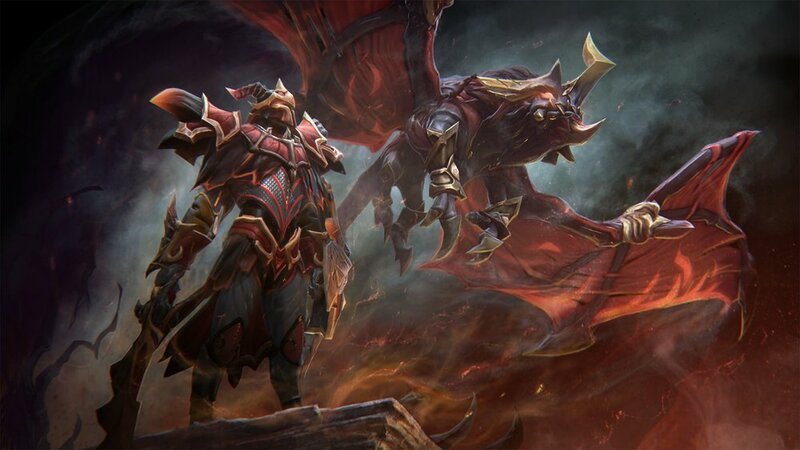 I prefer the former, but suggest getting the later in your first games and when fighting an opponent that is countered by the Silver Edge's active ability, such as Huskar. The Black King Bar is mandatory as you want to keep auto-attacking in teamfight when in Dragon Form. Disables are as always a serious issue. Assault Cuirass gives survivability, attack speed, and an aura to raise the overall damage of the team. I recommend it. The Sange and Yasha is a superb fighting item that provides useful stats, movement and attack speed, and a slow for ganks. Blade Mail and Heaven’s Halberd are your best defensive options. Sometimes you need to give up on damage and concentrate on surviving. I always take at least one of them when fighting against an Ursa. Daedalus is your choice for maximum damage if everything is going according to plans. I prefer the Satanic to the Heart of Tarrasque, but they are both viable choices. The latter is better when fighting teams with many burst damage dealers while the former works in any other situation if you can freely auto-attack. Consider a Moon Shard for more attack speed, or just use one if your inventory is already full. It will greatly boost the effectiveness of your Splash Attack. These are just some examples of the strength heroes with the highest win rate in this patch. Whatever your preference, don’t forget that often that win rate can be achieved only if a hero is picked against the right team and if properly build. I also suggest Tidehunter If you are looking for a strength based initiator - he is a top 20 drafted hero in competitive matches during December. More info on his gameplay in my talent guide. The top 20 most popular Dota 2 heroes in the mid lane during 7.20. We will learn the best picks in the meta, how to play or counter them, and the patch changes.